Does Your Pet Need a Probiotic? If your dog or cat struggles with gastrointestinal (GI) health, probiotics may be just what the vet ordered. Probiotics are live microorganisms that can be introduced into the body to help with digestion and offer protection from harmful bacteria. 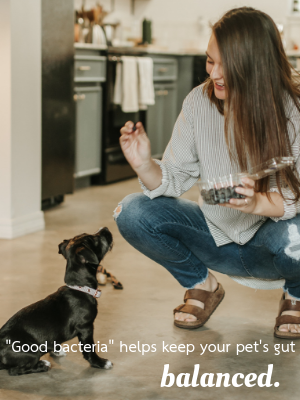 Just as live cultures in yogurt can help keep a human gut healthy, probiotics can also help maintain the natural balance of organisms (known as microflora) in a pet’s digestive tract. A normal digestive tract already contains many types of probiotic bacteria that reduce the growth of harmful bacteria and promote a healthy digestive system. Decreases in beneficial bacteria, often caused by stress, diet changes, or parasites, can lead to digestive issues such as diarrhea or inflammatory bowel disease (IBD). In addition, antibiotics often kill the good bacteria along with the bacteria responsible for illness. Adding a probiotic supplement—in capsule, tablet, or powder form—to your pet’s diet can help replace the beneficial bacteria that has been lost, returning the digestive system to a normal state. Probiotics may also aid in immune system function as well as improve many other conditions, such as allergies, diabetes, obesity, and liver disease. Think a probiotic might benefit your pet? Talk to your veterinarian!